G.I. Joe Modern Era/25th Anniversary fans rejoice! 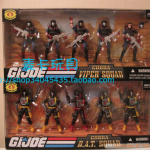 Macca428 posted an auction early this morning for the Cobra Viper Squad, and the previously unrevealed, Cobra B.A.T. Squad! 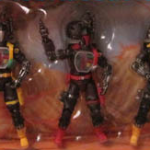 These troop builder 5 packs come with 4 troopers and a designated leader figure, in the Viper Squad’s case a Cobra Viper with gold faceplate, and for the B.A.T. Squad, a B.A.T. with red trim. 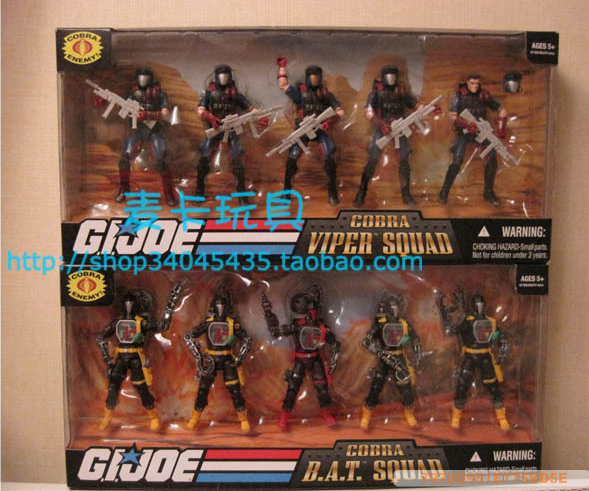 The Viper Squad was previously announced as a Toys ‘R’ Us exclusive no word on if it will remain a TRU exclusive or be released at mass retail. However the B.A.T. Squad was an enticing surprise and fans hope we see it eventually. A B.A.T. troop builder was at the top of many wishlists for a multi-pack in the 25th Anniversary line and it seems that us fans may finally get what we wished for! Click on the thumbnail to the left to check it out! Looks like it's going to be an assortment. Probably 2 of each to a case. Hope it remains a TRU exclusive. I'd love to pick up the BAT set. That's about the only toy I ever really wanted to army-build. I want to army build Resolute Troopers, those Troopers RULE! Wait...wouldn't that be a cave? I do like the Resolute troopers, but B.A.T.s always have a special spot for me. Even as a kid, I wanted a whole army of them like the cartoon had. But it's very hard at that age to convince your parents to buy more than one of the exact same toy. They tend to remember these things, for some odd reason. But hey, buy this set and instant B.A.T. strike team!